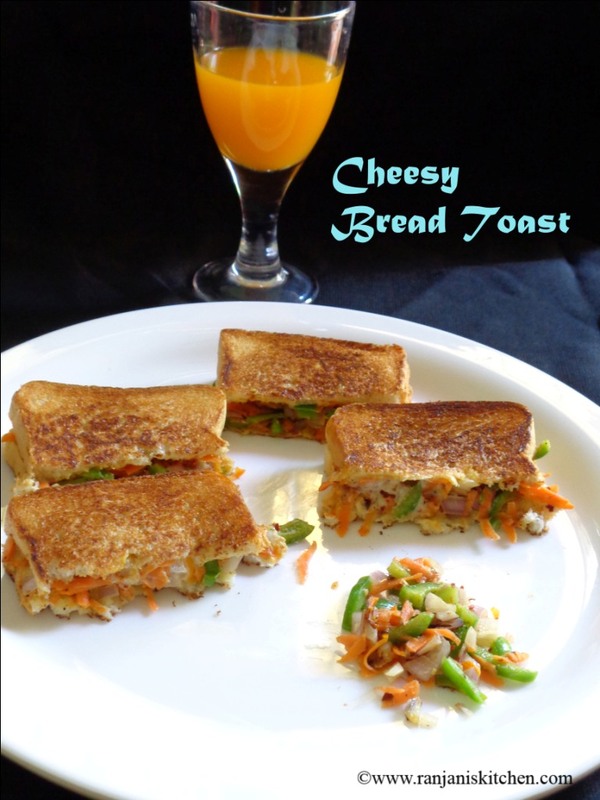 Cheese Bread Toast – A simple and healthy quick breakfast ideas or for evening supper.In busy weekdays if we don’t have time to prepare separate breakfast after finishing the packed lunch schedule, we can finish our healthy breakfast with this cheesy veg toast. Its really a simple method of making and kids will love for sure. Take a wide bowl, mix up all the ingredients and give a mild toss to blend all the ingredients well. 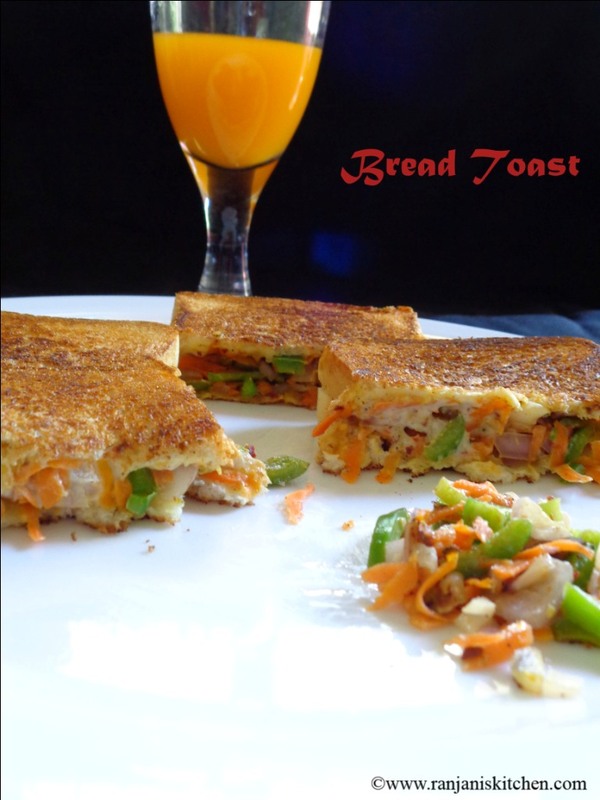 In a bread slice,place 2 spoonful of veggie mix and spread all over the bread. Place another plain bread over the veggie filled bread. Repeat the same for remaining breads and keep them aside. Heat a dosa pan, once heated sprinkle little ghee on it and place the stuffed bread. Keep the flame low or medium to avoid burning of breads. While toasting one side, sprinkle some ghee on the top and flip to toast other side. Once done on both sides, take in plate and serve with ketchup and coffee/fresh juices. I used tin cheese (Amul) so I shred it. If you are using cheese sheets, you place cheese sheets over the veggies and enjoy. It will be awesome. Instead of ghee you can use butter. While using butter apply butter on both sides of bread and toast it. 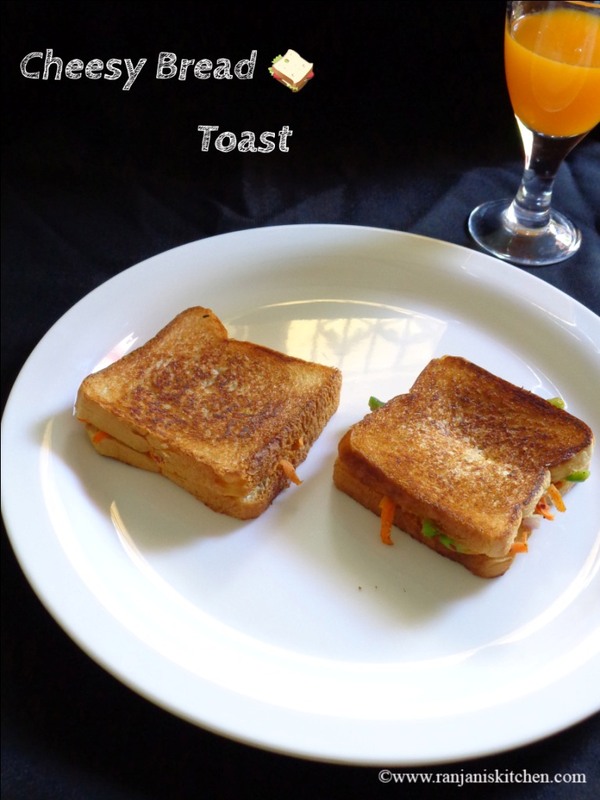 If you have bread toaster or grilled sandwich maker you can use. Once the dosa pan is heated, keep it in low flame and toast it. Over heat in pan will burn bread and spoil the taste. looks tempting and filling sandwiches..